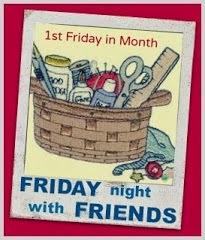 Last night I sewed along with many other quilters and stitchers over the net. The project I worked on was my Michelle Ridgway Xmas quilt. Last year Michelle sent me a new stitchery each month which I could stitch in whatever colour I liked. I chose Mistletoe, a Cottage Garden thread. I finally finished all the stitcheries last year and am now in the process of putting it together. Here is where I got up to last night. The blocks are sashed and the middle row is joined so on the homeward stretch now. Michelle has the pattern available so if you like it go over and check out all her patterns using the link above. A big thank you to Cheryll for hosting. To check out all the other blogs and see what other people were working on last night go here. Well must go as I am off to have lunch in the park with my sons and their families. Great work - it will be gorgeous when done. See you soon. Such a pretty project Noela, enjoy your lunch. The stitcheries look wonderful. It will make a cute quilt. Lunch in the park with family sounds like a real treat. Have a nice time. well done, lovely choice of corner fabrics. Love the stitcheries, and putting it all together is fun too. Enjoy lunch. Wow you are going great guns there Noela, very nice. Love your version .. It's fun seeing it all come together ..
Gorgeous work and fabrics !! Lovely little stitcheries Noela. Its going to be a very cute quilt full of Christmas Cheer and whimsy! The tartan and the mistletoe background is just perfect. Gorgeous so far, will look great when completed. Beautiful blocks Noela, hope your time at the park was nice. You've made a lot of progress, well done. Lovely work Noela, the colours and stitcheries work beautifully together. WOW! They look great Noela!